This is the second in a series of posts about solving common problems with puppies. Follow the whole series by subscribing to our blog at the bottom of the page. Here at Pauley’s Pups, we know that dogs love to be in the great outdoors, where they can run and play. Many dogs have a natural habit of constantly digging up the yard, destroying landscaping. Dogs are also famous for the comical display of trying to dig a hole indoors, straight through the floor. While a digging dog can be an amusing sight, it can also signal to you that your dog needs more human attention. If left unsupervised too often, dogs will amuse themselves, often with the instinctual act of digging. When your dog is a puppy, forming most of her habits, try not to leave her alone outside for long periods of time. Schedule outdoor time when you or someone else can be present. While outside, play fetch with a ball or frisbee, or tug with a chew toy, and keep your dog engaged and active. Of course, plenty of exercise, training sessions, and regular trips to the dog park are ways to keep your dog’s attention away from the digging up your immaculately trimmed yard. 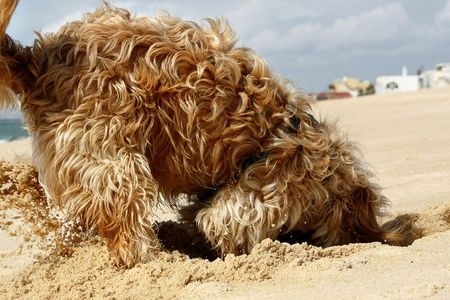 Dogs will often dig just because they are bored and want to satisfy their innate curiosity. Dogs are also prone to the classic canine activity of burying their toys. You may notice your dog nuzzling a toy into the corner of a room. This is very natural behavior, but if you leave your dog with their toys, and enough time alone outside, you may find that they begin to disappear. If you find it necessary, allow your dog to have his own “digging spot”. Set aside a space in your yard where you don’t mind a hole, or get yourself a sandbox, and train your dog to confine his digging there. After all, she doesn’t really mind the difference between a beautiful patch of flowers and an ugly patch of dirt. If she starts digging elsewhere, just give her that stern “no” and redirect her behavior. Lastly, make sure your dog has a shady place to lie during the summer months. Dogs sometimes dig to make a cool patch of earth for themselves on which to lie. So protect your dog from the heat by giving her a designated, cool sanctuary. For certain breeds, like terriers and Dachshunds, digging is an instinctive imperative that is more difficult to divert, and for most dogs it is a natural part of behaving like a dog. You can help your dog curb this annoyance by giving him extra attention, supervision, and activity. And of course, that spells, LOVE. Pauley’s Pups is a pet store in Ashland, Virginia that specializes in small breed dogs.